5 years ago the first all female anti-poaching unit was created to combat wildlife crime, particularly rhino poaching, in the greater Kruger National Park in north eastern South Africa. They go by the name of the Black Mambas. The idea behind the Black Mambas is inspirational but the women themselves - from local communities, which are frequently poor and disadvantaged - are my absolute heroines. These women through peaceful means, have caused poaching rates to fall to by 76% and bushmeat by ... See More 78%. As many of you will know, poaching of African wildlife particularly elephants and rhinos was the motivation behind my first children’s book and so these ladies have a special place in my heart! SO I’m delighted that today we’re joined by one of these amazing women - Lewyn Maefala - who heads up their community environmental education programme ‘Bush Babies’. Her enthusiasm is infectious and we had such a laugh over some of the stories of life as a Black Mamba but there are some harrowing stories too. How the Black Mambas are effective in the war against poaching even though they are unarmed. 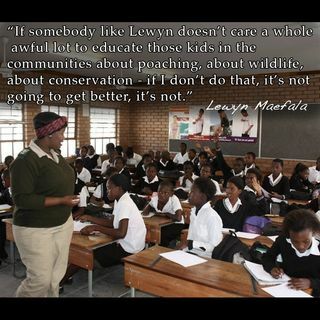 How you stop the children of poachers from growing up to become poachers themselves. Changing the traditional African attitudes about women. The publishing of this podcast episode ties in with the New York WILD Film Festival (media partners of Twig.fm) which begins today and runs till the 25 February. A documentary about the Black Mambas is one of the finalists! This is fantastic film festival so please check it out.